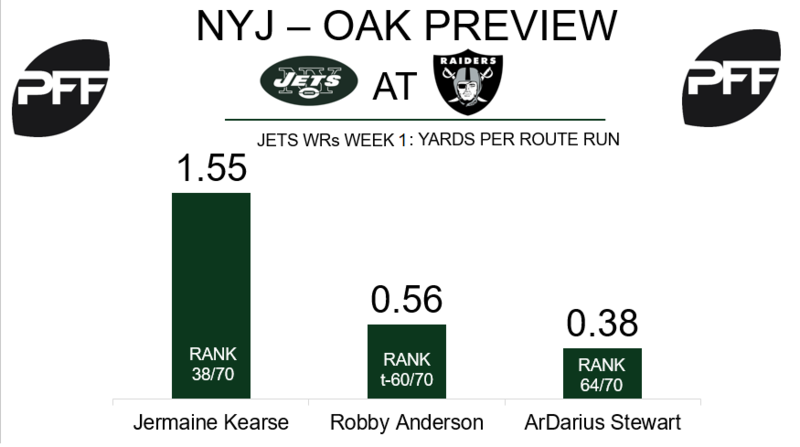 WR Jermaine Kearse vs. CB David Amerson – Kearse was very average in his first game with the Jets, catching seven of the nine balls thrown his way for 59 yards and a passer rating of 54.4 when targeted, which ranked 55th out of 70 qualified receivers. He averaged 1.55 yards per route run, which was good for 25th. Kearse will face off a lot with David Amerson, who was thrown at four times by Marcus Mariota in Week 1 and allowed two catches for 34 yards and a passer rating of 79.2. He wasn’t tested much, but with Kearse being the top option in New York’s attack, it will be interesting to see who wins this battle this Sunday. TE Will Tye vs. LB Tyrell Adams – The Jets don’t get much production from their tight ends, but if there ever was a week for Will Tye to get it going, this would be it. He actually had a solid Week 1 by Jets tight end standards, as he caught all three balls thrown his way for 34 yards and a passer rating of 113.9. This week is a great opportunity for him to have a big game, as linebacker Tyrell Adams got smoked in coverage last week for Oakland, as he was targeted nine times and allowed eight receptions for 110 yards and a passer rating of 117.6. He allowed 3.33 yards per cover snap, which was easily the highest out of 40 qualified inside linebackers. T Brandon Shell vs. EDGE Khalil Mack – Shell will have his hands full this week on the edge, as one of the premier pass-rushers in the NFL will be matched up with him for a good portion of the contest. Shell had a pass-blocking efficiency rating of 96.3 last week, which was tied for 24th out of 60 qualified offensive tackles. Mack accumulated six total pressures last week against the Titans, tied for the fourth most out of 34 qualified 3-4 OLBs in the NFL. 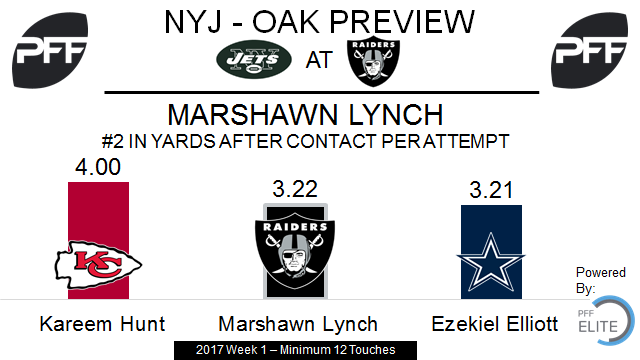 RB Marshawn Lynch vs. LB Darron Lee – Lynch looked like he never left in his return to the NFL last week after sitting out the 2016 season. He is still very hard to bring down, as he forced five missed tackles at Tennessee and was second among running backs with 12-plus touches in yards after contact per attempt at 3.22. He’s third in PFF elusive rating (a runner’s success beyond the point of being helped by his blockers) after leading that category in 2014 and 2015. Lee struggled in his rookie season last year, finishing 86th of 88 qualifying linebackers with a PFF grade of 36.2. He missed six tackles in 74 attempts, a 12.3 tackling efficiency that ranked 28th at linebacker. G Gabe Jackson vs. DI Muhammad Wilkerson – Wilkerson lined up on the left side in 58 of 68 snaps last week, so Jackson will face him most often. In 2016 Jackson played the most pass-block snaps without allowing a sack of any guard with 628. He didn’t allow a single pressure in 35 attempts last week against Tennessee. After suffering a broken leg at the end of the 2015 season, Wilkerson’s grade fell from 86.6 in 2015 to 49.5 last year. He ranked 94th of 108 edge defenders in PFF pass-rush productivity (pressure created on a per snap basis with weighting toward sacks) in 2016. TE Jared Cook vs S Jamal Adams – The Raiders signed Cook as free agent to help improve a unit that ranked 29th last season in yards per route run from tight ends at 1.05. Of the 27 tight ends that ran a minimum of 20 routes last week, Cook’s 1.87 yards per route run was fifth. Adams was the sixth-overall pick in this year’s NFL draft, and his 91.0 PFF grade was the highest grade for any FBS safety in 2016. Last week he missed two tackles in seven attempts, and allowed two receptions for 39 yards on 28 snaps in coverage.